1The College de France chair of indology is called, during the time of my tenure, “chaire d’Histoire du monde indien”. “Monde indien” is a French rendering of Anglo-Indian “Greater India”, a concept not too much different from Sheldon Pollock’s expression: “the Sanskrit cosmopolis”, which refers to a set of countries whose political divisions cannot hide the much more important fact that all of them have or had at at a time a culture informed by Sanskrit language and literature. For no many people, indologists being no exception, are conscious that the India concept, either in its geographical (the Indian subcontinent bordered by the Arabian Sea, the Bengal Gulf and the Himalayan mountains) or geopolitical (today the Republic of India; at its biggest extent, British India as it was in 1914) limits, is significant for political history only. What we are used to call Indian civilization is a late-comer in many parts of the Republic of India. On the contrary countries which were never part of any «Indian» polity, e.g. Burma, Thailand, Indochina (mainly Cambodia), ŚŚrīīī Lanka, some Indonesian islands, among them Bali, Java, Sumatra, during parts of the first millenium A.D. at least, were culturally as much Indian as Andhra Pradesh or Bangladesh during that very period. In these countries, non-Sankritic languages were spoken and local gods were worshipped. But the language of culture and politics was Sanskrit as in India proper, or Pali; Upper stratas’ cults were Hindu or Buddhist, as in India proper; artists and architects followed the precepts of Sanskrit technical treatises. This stele, found in Fajaz Tepa, a Buddhist monastery in Southern Ozbekistan, was made near-by that place or even at the spot. 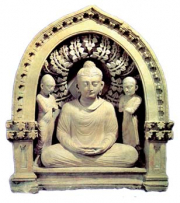 The subject is Indian: it represents the Buddha, sitting under the fig-tree, i.e. at the very place where he got Awakened. The style makes it part of the Graeco-Buddhist art of Gandhara, the country whose head-town is now called Peshawar, in Pakistan. 2North of the Himalaya and Hindukush mountains, Indian influence was linked with Buddhism. Tibet, despite the difference in languages, is the direct heir of Gangetic Buddhism. Many Tibetan monks used to know very well Sanskrit. In Afghanistan, Ozbekistan, Tadjikistan, many Buddhist monasteries were established : these countries were used as a kind of springboard for the monks who brought Indian Buddhist texts and images to China and (undirectly) Japan with much success. But the influx was both ways. From the 2sd c. BC till the 6th c. AD there existed kingdoms extending both North and South of the Hindukush mountains. The Muslim armies then put on the Delhi throne Afghan, Turk or Moghol Sultans. These and their followers during many generations kept to their own maternal language and were able to enforce their tastes on the population. 3Having these facts in mind, and wishing to bring together the few European scholars whose subjects extend both on Central Asia and the Indian subcontinent, the European Society for the study of Himalayan and Central Asian Civilizations (http://seechac.org) was established in Paris in 2007. It can be easily understood why the Collège de France, where Sylvain Lévi and Jean Filliozat did so much to show that the frontiers of India extended at times much farther than than the frontiers of the Indian subcontinent, and the Chair of History of India and Greater India hosted the first international colloquium of the newly founded society. 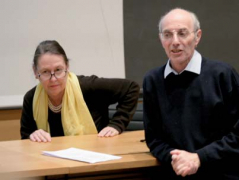 The subject of this colloquium was “Artistic creation confronted with political and religious constraints, from the Himalayas to Central Asia, from antiquity till now”. Participants could thus choose to deliver a paper on religion (e.g. the creation and evolution of the images of the Buddha and gods) or politics (e.g. painters and sculptors forced to follow courtly etiquette and conventions). They could on the other end treat contemporaneous subjects such as the modifications of lamaïc danses and traditional Tibetan theater confronted both with the normalizing tendencies of Chinese authorities and the taste of the European and American audiences for which they now often perform. 4The colloquium was held on April 27 and 28, 2009. The audience numbered c. 100, among them many scholars. The number of speakers had been limited to 20, so as to give more time to discussions. These were followed with great interest by the audience. The speakers were from France, Italy, Great-Britain, Germany, Canada and the USA also, coming to Paris and staying there at their own expenses, an indication that the newly-founded SEECHAC (French acronym for Société Européenne pour l’Etude des Civilisations de l’Himâlaya et de l’Asie Centrale) rouses some interest even beyond the European borders, an indication also of its usefulness for scholars. 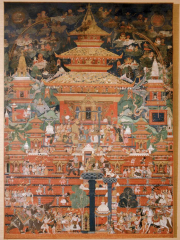 This Nepalese painting, bequested to the College de France by Dr. Anne Vergati, shows the King Pratapamalla in 1664 while presiding over a purely Indian ceremony, the weighing of his son against his weight in gold, to be distributed later to brahmins. 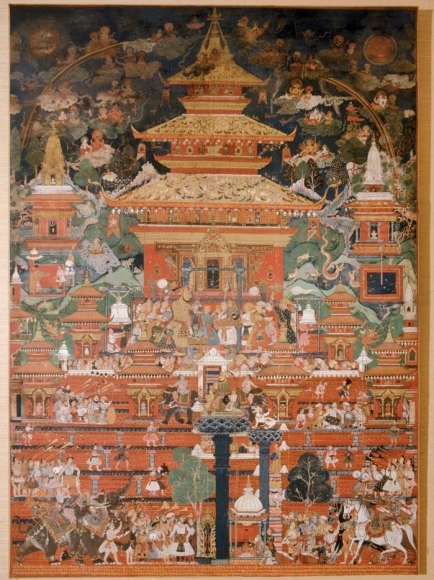 The style of the building is himalayan, the manner of the painting and the dresses of the participants are reminiscent of the Indian Moghul imperial art. The founder of the Moghul Empire and many of its dignitaries were born in Central Asia. 1 A detailed program of the colloque can be found on www.college-de-france.fr and http://seechac.org. 5Many papers were of great quality, dealing with the Oxus Civilization or BMAC, symbols of power in India, Khorezm and Iran, changes in iconography in Tibet and Dunhuang, political circumstances when some important Tibetan monasteries were founded etc1. The audience was also impressed by the vitality of studies on Tibet, both ancient and contemporary. By contrast, some important subjects and fields seem now less fashionable. Young scholars would gain at being more interested in them. The emergence of a new generation of young and enthusiastic anthropologists specializing in Tibetan contemporary subjects and diaspora was also a salient feature of these very busy days. 6In any case, concerning its main goal, the colloquium was a success: it enabled scholars with subjects and conceptions at first sight very different to meet together and thus benefit in the future from the ideas, methodologies and problematics they could hear being expressed in the papers read out, during the discussions with the audience and in personal talks with colleagues whose names they only knew before. The aims of the colloquium were to break the limitations of specializations; give young and experienced scholars a chance to meet together, get acquainted and confront their views; gather colleagues from every European country with a view to enable them to establish research groups on an European scale, for, considering the small number of scholars and the magnitude of the field, we are in need of constituting such groups for better research and also because European multi-national groups only would be financed by the European Commission. 7The next SEECHAC colloquium will be held in Roma, in 2011 most probably for SEECHAC is a truly European association.